As tax season approaches, be on guard for tax scams, including phony IRS messages and phone calls. Protect yourself by using caution when viewing emails, responding to telephone calls, or getting advice on tax issues. 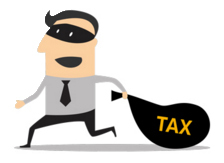 Tax scams happen every year and can take many different forms. Don't respond to scare tactics. Contact the IRS directly to verify phone calls, electronic or paper messages. Don't open files, click links, or call numbers in unsolicited emails, text messages, IMs, Facebook postings, tweets, etc. Always verify the identity of a person asking you for information, money, or access to your accounts, computer, etc. If you can't verify something is legitimate, ignore, delete it, or contact the person/organization who supposedly sent it to ask. Never - ever - ever - reveal your password!! Report crimes and criminal activity to the campus Police Department at (831) 459- 2231 or provide anonymous tips at police.ucsc.edu. Forward IRS-related scam emails to phishing@irs.gov. Report IRS-impersonation telephone calls at https://www.treasury.gov/tigta/contact_report_scam.shtml.